Discover how to treat stomatitis in cats naturally. Discover how to treat stomatitis in cats naturally. Why? Because this is by far the most efficient, the least traumatic (to both you and your cat), as well as the most economical way. 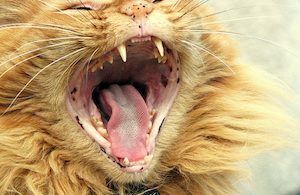 First, let’s look at what stomatitis in cats is. The symptoms are a little different to gingivitis in cats. Your vet will tell you that this is caused by one of various bacterias or viruses. Their solutions, depending on the severity of the condition as well as other considerations, will normally start out with antibiotics. The strength of these will increase with each visit. When these are exhausted, the cortisone treatment starts. When these are exhausted, then full teeth extraction is the only option left to them. These options don’t come cheap, especially the extractions. I don’t know about you, but these treatments seem to be very archaic to me. Not only that, but bacterias and viruses are never the cause of a condition. They are the outcome. They are the outcome because the immune system is too weak to prevent them. So what is the real cause of the problem? That’s always a good starting point because in that lies the solution. As a natural health consultant, that’s always the first thing I search for. And the main culprit is the diet. Commercial cat food is, across the board, highly unsuitable for cats, is toxic and it destroys the immune system. Cats are obligate carnivores. Their natural diet not only supports a healthy immune system, it also massages the gums and cleans the teeth with every bite. A wild cat will never get stomatitis when food is plentiful. Changing the diet to a quality, natural one can be all that is needed to reverse stomatitis in cats. Would you like to know how to treat stomatitis in cats naturally? What the best diet is to maintain this? And how to improve the health of your cat’s immune system, so infections can’t take up residence? All well within the budget of most people. (No bank loans required – promise).